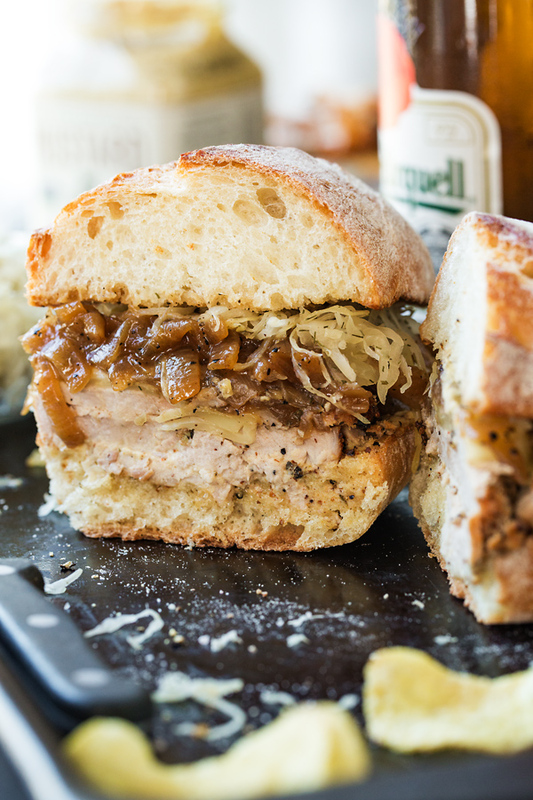 Savory, flavorful and loaded with beer-braised onions and sauerkraut, this juicy pork tenderloin sandwich has all the right ingredients to make the best comfort-food sandwich, one in which the love can truly be tasted. Growing up in an eastern European household, we often enjoyed rustic dishes rich in braised cabbage or sauerkraut, paired with some sort of savory and saucy meat, plus potatoes, and they were some of the most comforting meals I can think of. A meal like that is an endearing and delicious kind of “peasant food” for me, and it’s one of my favorite styles of food to this day, one that I still gravitate towards preparing when it’s been a while since I’ve made something that celebrates my European heritage. Nothing was more delicious to my Slovak parents or myself than dipping good bread, fresh from the bakery, into that savory leftover sauce from the meat, with those little bits of onion in it—those flavors coated the palette with such richness as the soft-yet-slightly-chewy bread simply melted away on the tongue. To this day, I love to dip my bread in a sauce like that, which got me thinking that perhaps a delicious and hearty sandwich could be made with some of those same flavors to bring back that experience. And a roasted pork tenderloin sandwich sounded like just the ticket. 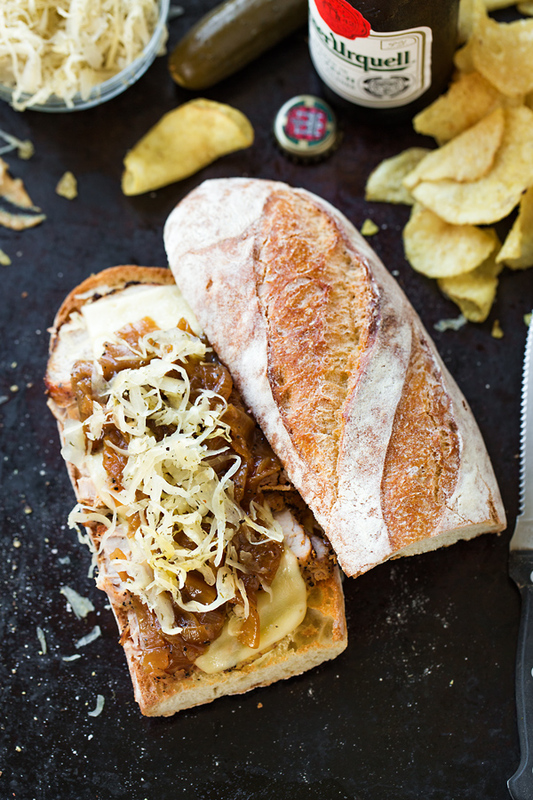 All peppery and crusty on the outside and tender and juicy on the inside, smothered with beer-braised onions with their dark, slightly sweet-bitter notes; and sauerkraut with its crispy, tangy bite, and melted Swiss cheese—it’s the perfect combination for a hearty sandwich dripping with love and a slightly “old-world” vibe. 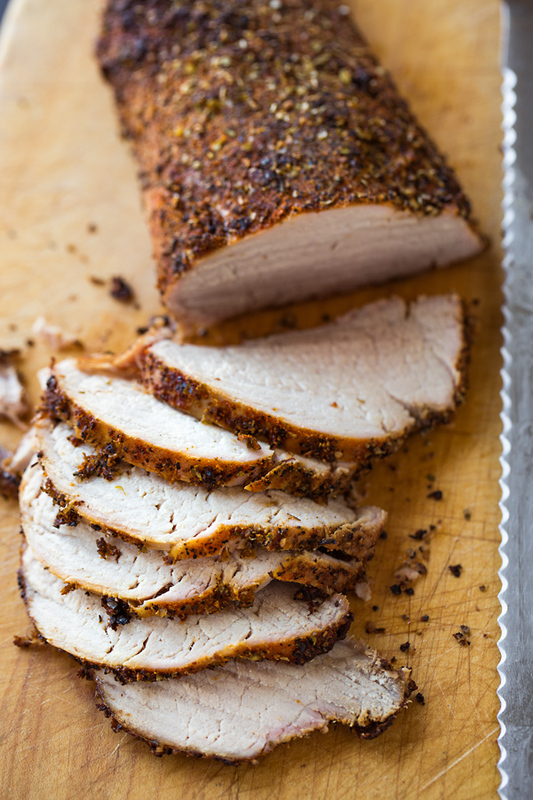 Because roasted pork tenderloin is a naturally tender and juicy cut of meat, all it needs is a liberal rub of seasoning: a generous rub of oil, a bit of salt and pepper, a pinch of caraway seeds, a little smear of mustard, plus a sprinkle of dried herbs. Then, it simply roasts in the oven to golden-brown perfection before finally being thinly sliced up so it can be easily layered for a sandwich. And while your pork roasts away, simply braise your sliced onions in a good beer—one that you would drink along with your sandwich—until sweet and caramelized. Then, all that’s left is to build your scrumptious sandwich by adding a slice of Swiss cheese, broiling just until melted, and finishing it off with the onions and that little sprinkle of cool sauerkraut for an awakening kick that cuts the richness. And with an extra little smear of spicy brown mustard on your roll? Simply scrumptious. Caraway seeds: If you can’t find ground caraway seeds, you can get whole ones (which is what I do), and grind them yourself in a spice grinder or pestle and mortar; or, if you prefer, you can leave them out all together. Use a digital thermometer to get proper temp: It is recommended for pork to have an internal temperature of between 145° (for medium rare) to 160° (for medium). I like to remove mine from the oven around 150-155°, and allow the pork to rest for 10 minutes before slicing (the temp continues to go up slightly as the meat rests). So use a digital thermometer for accuracy, rather than go solely based on time. Choose a beer you’d like to drink to braise your onions in: I love Pilsner Urquell, so I used a cup of that for my beer-braised onions. But feel free to use whatever type of beer you like, something you’d drink along with your sandwich! Rinse your kraut to make it more mild: Since sauerkraut can be quite sharp and tangy, you can give it quick rinse under running water to cut that sharpness—just pat dry with paper towel. Otherwise, just use it straight out of the package. 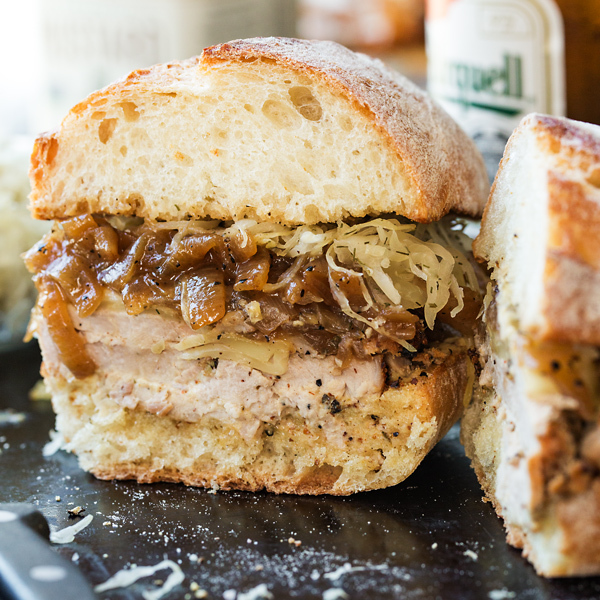 Savory, juicy and mouthwatering, this roasted pork tenderloin sandwich, loaded with beer-braised onions and crisp sauerkraut, pairs deliciously with an ice cold beer and some chips! -Preheat your oven to 425°, and place a wire rack over a foil-lined baking sheet. -To a small ramekin, add 1 ½ teaspoons of salt, ½ teaspoon of black pepper, the granulated onion and garlic, the Italian seasoning and the ground caraway seeds; set these dry rub ingredients aside for a moment. -Place your pork tenderloin on a work surface (or into a large bowl) and drizzle a couple of teaspoons worth of the oil over; rub the spicy brown mustard all over it, and sprinkle the dry rub evenly over, as well, rubbing it in. -Place the tenderloin onto the wire rack, and roast for about 40-45 minutes, or until a digital thermometer inserted into the thickest part registers 155° (as the meat rests the temp will come up slightly more). -While the tenderloin roasts, add the butter to a large, heavy bottom pan (I love my cast iron skillet for this) set over high heat, and once melted, add in the sliced onions, along with a couple of good pinches of salt and pepper; stir the onions around occasionally, and allow them to caramelize for about 10-12 minutes, or until golden; then, add in the beer, and allow it to vigorously bubble and boil, reducing down for about 5 minutes, until the onions are glossy and have a jam-like consistency; set onions aside and keep warm. -Once the tenderloin has roasted, allow it to rest for 10 minutes, then slice thinly. 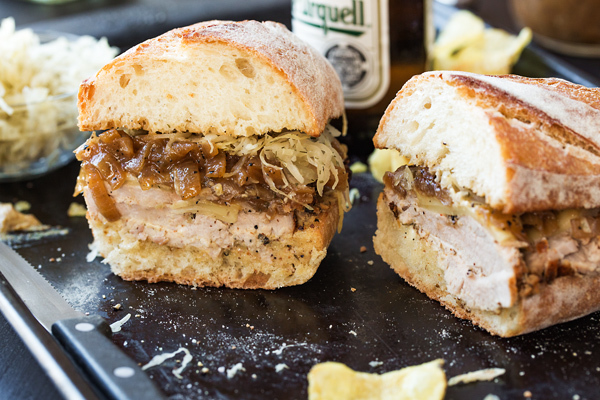 -To assemble the sandwiches, spread some of the mayo and the mustard on the bottom of the roll, add some slices of pork tenderloin, and top with a slice of Swiss cheese; place under the broiler for a couple of minutes until melted, then top with a couple of tablespoons of the beer-braised onions, and about ¼ cup of the sauerkraut; then, spread some mayo and mustard on the top roll, and enjoy! 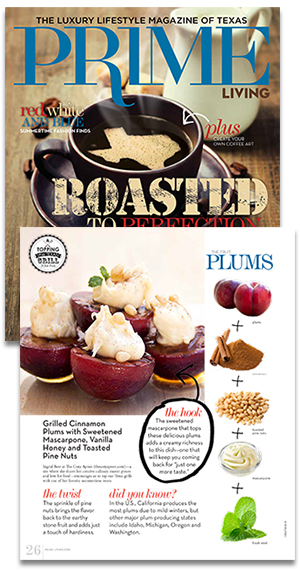 Hi Velva, that’s so kind, and I hope you and your hubby do get the opportunity to try this recipe since he’s a fan of these types of flavors! Drool city, population me. These sammie look TO DIE FOR (not even being dramatic.) Must make these soon soon soon! Haha! Thanks Karly, hope you do! Not only can the love be tasted but it can also be seen in the images as well. Love the images and the creativity on display here. Thanks for sharing this. Karl, that’s so kind of you! Much appreciated. This is such a good sandwich!!! Leftover pork makes for a GREAT gyros. 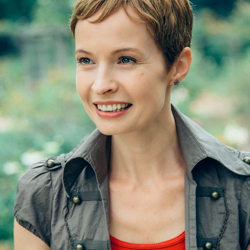 So glad you enjoyed, Melissa!